"With Horizon, we can image the veins in one color and the arteries in another color, and so forth. In cerebral studies we actually feel like we're looking at a color-dissected brain." "It's very important that we get outstanding images from whatever printer we're using. With Horizon we simply see critical anatomy much, much better than we did with our previous system." The Hyman-Newman Institute for Neurology and Neurosurgery (INN) at Roosevelt Hospital and Beth Israel Medical Center is, in a word, elite. Established in 1996, New York-based INN, an entity of Continuum Health Partners, is a comprehensive, multidisciplinary center where patients with neurological disorders of all types and severity are diagnosed and treated. The specialists on staff are leading experts in their disciplines — the very best of the best. Key to the INN's success has been the Center for Endovascular Surgery, a multi-disciplinary group of physicians, registered nurses and radiology technologists that treat more than 1,000 patients annually. As part of the care they receive, a high percentage of patients undergo angiographic studies with the images printed using a Codonics Horizon Multimedia Dry Medical Imager. Until recently, the diagnostic images captured during imaging procedures were printed using an imager with little versatility. It only printed in black and white, and accommodated just one media type and size, according to Mindi Nahoum, nursing manager for the center. "We couldn't print in color, and certain images didn't print clearly," said Nahoum, a nurse with the center since 1985. "Our new Codonics imager more clearly defines where the disease is." That change for the better occurred in February 2005 when the center acquired the Horizon Ci. Now, the clearest images possible are being presented with 14-by-17-inch and 8-by-10-inch film, 14-by-17-inch and letter-size paper, plus letter-sized color paper, enabling physicians to evaluate disease and plan surgery and treatment with unmatched clarity and accuracy. "At the center, we take X-ray images in real time — while we're doing surgery," Nahoum said. "It's very important that we get outstanding images from whatever printer we're using. With Horizon we simply see critical anatomy much, much better than we did with our previous system." At the INN, there are many patients present with life-threatening or debilitating conditions that involve the brain, spinal cord, head, face and other vital sites. Common diagnoses include cerebral aneurysms, arterial venous malformation, birthmarks, vascular tumors and other vascular abnormalities. Often, neuroangiography is required in order to diagnose these conditions as quickly and accurately as possible. Imaging during neuroangiography procedures. Its color enhancement enables physicians to better visualize the interior walls of arteries, said Joon Song, M.D., an interventional radiologist with the INN. As a result, vascular malformations are seen in greater detail. Portraying cerebral aneurysms. The use of color enables the clear differentiation of aneurysms from normal tissue, according to Song. Displaying 3-dimensional images created during fluoroscopy. With high-quality 3-D color images, surgeons can identify abnormalities in the context of a patient's facial or other anatomical markers, enabling improved surgical planning. 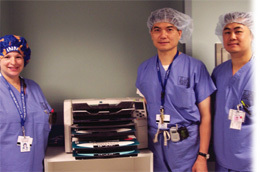 "At the Center for Endovascular Surgery we often create 3-D images," Yasunari Niimi, M.D. said. "With Horizon, we can image the veins in one color and the arteries in another color, and so forth. In cerebral studies we actually feel like we're looking at a color-dissected brain." Since the system was acquired, Horizon's role has been a multifaceted one. Because it prints on large media, neurosurgeons using 14-by-17-inch DirectVista Grayscale Paper can see high-resolution images while they operate due to a Horizon-exclusive room-light viewed media alternative at half the cost of film. Additionally, clinicians can print color images on 8.5-by-11-inch grayscale paper for inclusion in each patient chart — for the first time specialists can demonstrate to referring physicians and patients exactly what they accomplished during a procedure by showing them high quality printed images. The system also reproduces images onto 14-by-17-inch blue-and clear-based film for situations where actual film is desired, Song said. The center's discovery of the Horizon occurred almost by accident. In late 2004, INN colleagues who were using Horizon in conjunction with MRI studies began touting to Nahoum the high quality of images they were producing. After evaluating the system, Alejandro Berenstein, M.D., director of the center, decided to acquire the Codonics Horizon Imager. During the months since its acqui-sition, staff members have been delighted. "We were almost ready to begin downloading images from the various monitors in the patients' rooms, although that wouldn't have been optimal," said Nahoum, who called the decision to purchase a Horizon an easy one. "When the Horizon came along we thought it would be great to have copies of images for the operating room, for the patient, and for the patient chart. We haven't been disappointed." One Horizon is currently in use at the center, and two more systems are expected to go online during the coming months. Horizon systems used in conjunction with other imaging modalities, including CT and MRI, are available for use by the center, Nahoum said. The system clearly appeals to a broad range of physicians in various departments — from radiologists to neurologists to vascular surgeons. "Quite frankly, the Codonics system is less expensive to use," Song said. "If you can save $5 or $6 an image, which we do, it's a no-brainer." The Center for Endovascular Surgery uses Horizon exclusively during invasive procedures. In an exam, images focused on key sites are processed—usually onto 8.5-by-11-inch or 14-by-17-inch grayscale paper. The system's strengths include its ability to quickly and inexpensively produce diagnostic quality color and black and white prints as well as film. Horizon has been an overwhelming success in the three years since its introduction, largely due to those strengths and capabilities. All systems generate outstanding images, hold up to 300 sheets of film or paper, weigh less than 70 pounds, take up comparatively little space on a desktop or counter, and boast the fastest time-to-first print. "A major bonus of this imager is the ability to utilize various papers and film, especially ChromaVista Color Paper — which is durable and can be read in any light situation," said Danny Hom, technical supervisor for the center. "The vessels of the brain are particularly clear, as are bony anatomy and soft tissue." Its clinical capabilities aside, there are other advantages, Nahoum said. The Horizon imager was relatively inexpensive to purchase, is easy and comparatively inexpensive to operate, is reliable, requires little space, and has enhanced relationships with referrers and physicians alike. In short, it's been good for business — both within the department and in the context of cementing existing relationships (both physician and patient) in the community that the INN serves. "To be honest, we used to draw pictures for our patients on their consent forms, showing them what was going on," Nahoum said. "We certainly don't need to do that anymore. The Codonics Horizon has bumped us up a big notch in our ability to communicate with referring physicians and patients, and any time you can achieve that, you've achieved something important. "Thanks to Codonics, we're way ahead of the game."